The Oireachtas has held a special joint sitting in the Mansion House in Dublin to mark the 90th anniversary of the first Dáil. This morning's sitting was held to commemorate the first sitting of the Dáil, 90 years ago, when Sinn Féin TDs elected the previous December fulfilled their election promise to establish a separate Irish parliament. By coincidence, the same day saw the first shots fired in the War of Independence, when two RIC constables died in an ambush at Soloheadbeg, Co Tipperary. Sinn Féin had won 73 out of the 105 Irish seats in the 1918 general election for the Westminster parliament, of which 25 were uncontested. Unionists won 26 seats, all but three of which were in what is now Northern Ireland, and the previously dominant Irish Parliamentary Party won just six. Sinn Féin MPs decided to implement their manifesto pledge of abstention from the Westminster parliament and summoned all elected MPS to their alternative parliament, 'Dáil Éireann'. 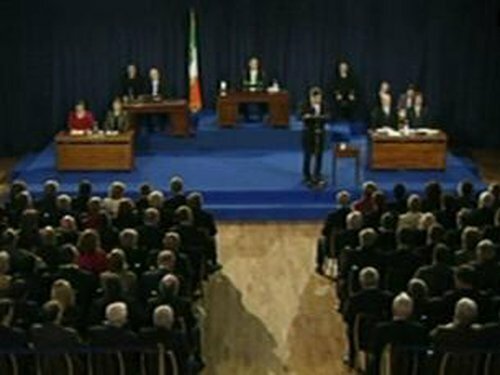 Unionists and members of the IPP refused to recognise the Dáil, and three Sinn Féin candidates had been elected in two different constituencies, so the first Dáil consisted of a total of 70 TDs. 43 of these were absent from the inaugural meeting as they were imprisoned or on the run from the British. In the event, a total of 28 members attended.